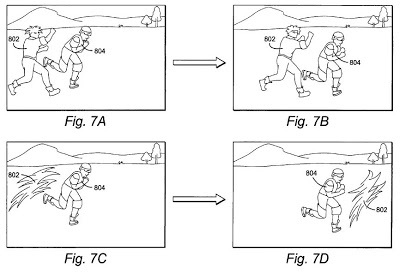 The ‘779 patent describes a feature used in the Max Payne series of video games—the ability to change the laws of physics depending on the state of the game character. In these games the player has the ability to slow down the game world in order to provide his character with special abilities. Generally, when this invention has been implemented, the camera shifts to the first-person view of the character while the time is slowed. This gives the player the feeling of actually being the character as opposed to just controlling a figure on the screen. The passage of time and/or the laws of physics may be changed depending on the state of a game character. For example, the slowing down of the game world may provide the game character with special abilities move quickly in a very short period of “game world” time. 1. A video game comprising: a ghost game character capable of possessing and dispossessing a plurality of different host game characters during game play wherein a game world view shifts to a view of a possessed host game character; and a time change effect for changing the rate at which time passes in the game world between a first rate when the ghost game character possesses one of the host game characters and a second rate when the ghost game character dispossesses one of the host game characters, wherein the changing between the first and second rates occurs gradually.